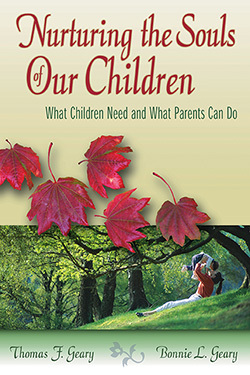 Nurturing the Souls of Our Children proposes that psychologically and spiritually balanced parents are best equipped to relate more deeply and joyfully to the uniqueness of their children. This is nurturing the soul. It is what children today need more than anything else. Based on their experience as parents, as church ministers, and as professional counselors for over 25 years, Dr. Thomas Geary and his wife Bonnie are well qualified to integrate the psychological with the spiritual. Their book offers hope to frequently overwhelmed and confused parents searching for values and guidelines in an increasingly materialistic society. Their suggestions are clothed in practical, humorous, and touching stories reflective of the real world where families live. Thomas F. Geary, Ph.D. was a clinical psychologist with 25 years of experience as a family therapist and served as a missionary in Peru as a Carmelite priest. He specialized in men's relationships with their wives and children. He often served as a consultant to churches, schools, and agencies. Bonnie L. Geary, MFT is a licensed family therapist with over 20 years of experience and works as a member of the Immaculate Heart Sisters of Los Angeles. She specializes in women's relationships with their husbands and children.